Animal Crossing is one of those rare game series that is beloved by a truly diverse group of people. Just check out the GameStop reservation line on release day—grannies, snot-nosed kids, and tattooed punks alike have found something to love in this most laid-back of life simulators. Still, even die-hard fans have admitted that after its first three entries, the series was getting a bit stale. Animal Crossing: New Leaf, the fourth entry in the series, has promised to shake things up by allowing the player to be the mayor of their town full of cute fuzzy and feathery villagers. Is that enough to re-ignite interest in the series? It was certainly enough in Japan, where the game dominated the sales charts for months after its release. Now that it's coming to North America, we've had the chance to see what all the fuss is about. With New Leaf, Nintendo has created the best Animal Crossing game yet, keeping the familiar elements that fans love while adding a ton of new gameplay elements and clever tweaks that make the experience feel fresh. 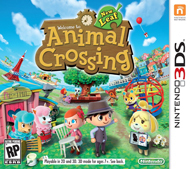 Animal Crossing is, at its heart, a free-form life simulation in which the player builds a home and lives in a village full of talking anthropomorphic animals. Major activities in the village involve collecting furniture and other kinds of interior decor in order to customize the home, catching and collecting bugs and fish, filling up the exhibits in the local museum, befriending animals, meeting up with friends to trade items and chill in each others' towns, etc. Days in the game operate in real time, with the village changing from hour to hour. It's a relaxing, slow-moving game that is meant to be played for a short amount of time each day. The life simulation aspects of Animal Crossing have been freshened up in New Leaf with the addition of many new items to collect. Along with new furniture sets and even more bugs/fish/fossils to find, the player can now wear custom pants, socks, shoes, a greater variety of hats, and other accessories. Even returning furniture models can be updated when the player unlocks a villager who customizes furniture, allowing the player to change the color and pattern of various pieces. Most importantly, the player is now the mayor of the town, and can build a wide variety of public works projects with both visual and practical uses. In previous Animal Crossing games, the player's biggest investment was in his or her own house, with house improvements costing hundreds of thousands of “bells,” the game's currency. That aspect remains, along with the ability to customize the house's exterior via Tom Nook's new housing shop. As the mayor, however, the player also has the ability to add decorations, new shops, and other amenities to the town, placing them wherever they're desired. All these things come with a price, and though the locals will chip in a bit, the player will be doing the lion's share of the public works funding. This means that no two towns will look alike, and it also means that there are far more objectives to work toward. Even Animal Crossing vets will be hard-pressed to amass a giant fortune in bells with the number of ways the game provides to spend money. Perhaps the biggest new gameplay element added to New Leaf can be found on the tropical island resort, which the player gains access to fairly early on. The resort not only features the opportunity to catch rare bugs and fish for sharks, but also plays host to an impressive variety of “tours,” which are actually mini-games that can be played solo or with friends. These tours challenge players to timed fishing, bug-catching, diving, fossil-hunting, and other contests, rewarding medals that can be redeemed for exclusive items on the resort. Players can even join Club Tortimer, which allows them to join up with random people from around the world to go on tours together. Many Animal Crossing fans have been hoping for more formalized games and contests to play with their friends when they visit each other's towns, and now they have a fairly impressive array of different mini-games that work well with the games user interface and controls. The tours come in three difficulty levels, with many of the three-star tours offering up a genuine challenge. Just try the shark-fishing challenge that requires cat-like reflexes. Overall, the tours are a fantastic addition to the game, especially when it comes to the multiplayer element. Along with these new features, small tweaks to existing systems make this Animal Crossing more entertaining to play than its predecessors. Many elements of the game that were once down to random chance now have a more game-like element to them. Gulliver, a seagull, now asks the player simple geography questions in exchange for a prize. The fox Redd, who once sold art that had a random chance of being counterfeit, has now made subtle visual changes to famous works of art. Savvy players can examine his wares and catch him in the act, separating the genuine articles from Redd's counterfeits using their own knowledge of the works in question. In addition, several activities and events that used to reward random pieces of normal furniture now award special, unique furniture sets. Holidays have also been retooled. Most of them are interactive in some way, so the player is actively celebrating instead of just watching the villagers observe the occasion. All these small changes add interest to the game and give the player yet more reasons to check in with their towns every day. All of Animal Crossing: New Leaf's activities are enhanced by an excellent localization that is full of humor and whimsy. From the terrible fish puns to the jock villagers calling female players “ladybro” to the adorably silly sea shanties that Kapp'n sings on the way to the tropical island, I dare anybody not to crack the occasional grin while playing. Villager AI has been improved as well. For instance, a villager visited my home early in the game and commented that my walls looked bare. The next day, he sent me a wall clock in the mail. Although there are still a set number of villager personalities, the things they say and do are diverse enough that they seem more like actual people than ever before.